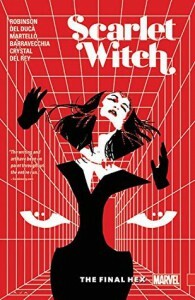 The continuation and final volume of Wanda aka Scarlet Witch’s stand alone series. We are introduced to more back story and learn what the future holds for Scarlet Witch and a little about her brother Quicksilver. With this final installment we learn more about Wanda’s family and what is causes problems with magick in the world. The story was intriguing and art was so so. There is a lot crammed into this volume. I did feel that because I never read any of Marvel’s Civil War story or any other comics with Scarlet Witch that I was lacking some information. I also knew basic things like her being Quicksilver’s sibling and who her parentage was suppose to be. I also feel the ending to this particular storyline was rushed and I was yearning for more of Wanda’s story. I would love to see more comics with Scarlet Witch. She seems to always end up in the background of other characters stories. I think she really needs more tales just following her. A witch with as much power as she has should not be in the background.